The class is designed to empower Tweens and teens by helping them build self-confidence, respect others and develop an awareness for their own body and surroundings. 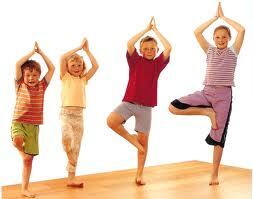 They will learn yoga postures and breathing/relaxation techniques, all while having a good time. Life skills that will last a lifetime. PLEASE HAVE YOUR CHILD BRING A WATER BOTTLE TO CLASS! THANK YOU! Adult Yoga at the same time. Prices and more details here!